^ a b c d Hepplewhite, T.A. 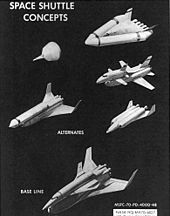 The Space Shuttle Decision: NASA's Search for a Reusable Space Vehicle. Washington, DC: National Aeronautics and Space Administration, 1999. ^ General Accounting Office. 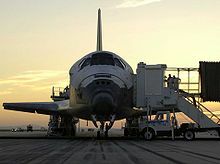 Cost Benefit Analysis Used in Support of the Space Shuttle Program. Washington, DC: General Accounting Office, 1972. ^ Brooks, Dawn The Names of the Space Shuttle Orbiters. Washington, DC: National Aeronautics and Space Administration. Retrieved July 26, 2006. 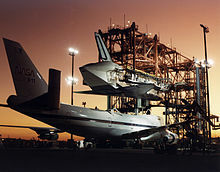 ^ National Aeronautics and Space Administration. "NASA Names New Rockets, Saluting the Future, Honoring the Past" Press Release 06-270. June 30, 2006. 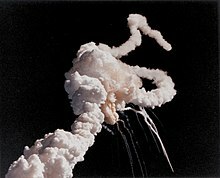 ^ NASA (2003) Columbia Accident Investigation Board Public Hearing Transcript Archived 2006年8月12日, at the Wayback Machine. ^ A Rocket to Nowhere, Maciej Cegłowski, Idle Words, March 8, 2005.